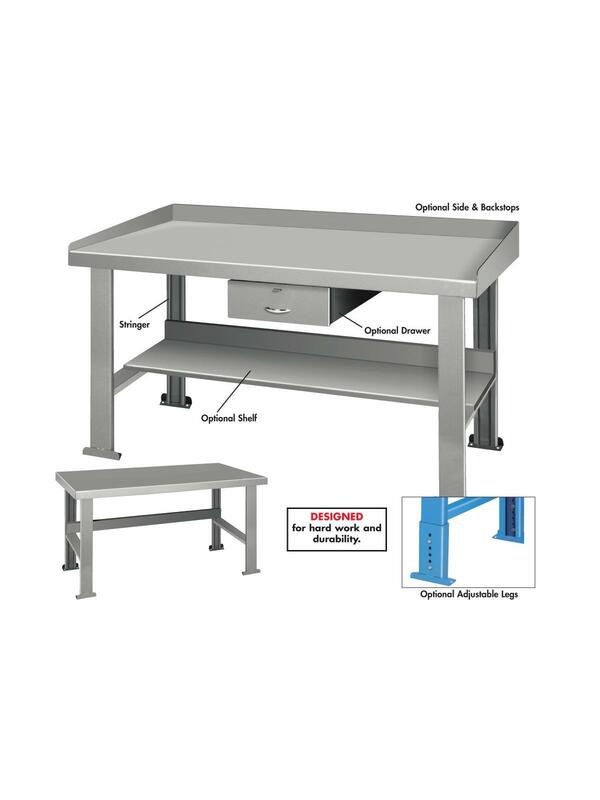 Built for heavy-duty support and working surface-handles loads up to 3000 lbs. Perfect for assembly or maintenance work. Here's the bench designed for hard work and durability. Made of 12 ga. steel top, 16 ga. stringers and shelves. 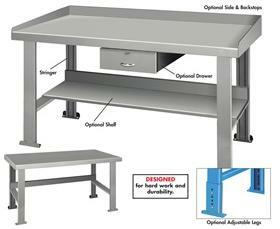 The top, stringer, and legs are standard bench components and are all reinforced for additional strength. All benches 96" or longer have 3 bench legs. Available in Steel Top or Maple Top. Custom design, laminate and compositions available - call for more information. FOB Shipping Point. To order these colors, add the SKU to your shopping cart and indicate the desired color in the comments section. Custom colors available at an additional cost. Custom Design...All items can be modified to suit your needs. Call for information. 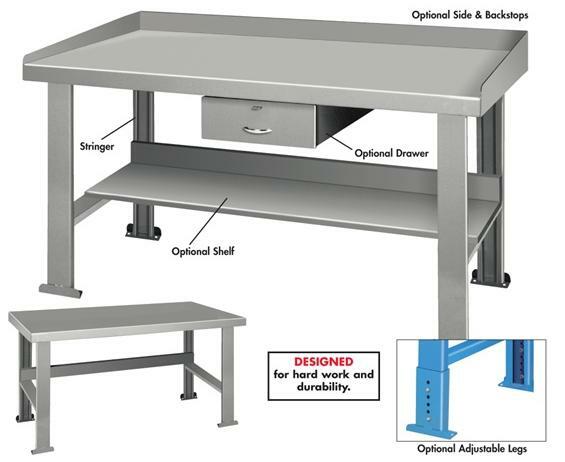 See Related Items tab for Industrial Work Benches - Optional Accessories. D x W 24 x 120" 24 x 48" 24 x 60" 24 x 72" 24 x 96" 28 x 120" 28 x 48" 28 x 60" 28 x 72" 28 x 96" 30 x 120" 30 x 48" 30 x 60" 30 x 72" 30 x 96" 34 x 120" 34 x 48" 34 x 60" 34 x 72" 34 x 96" 36 x 120" 36 x 48" 36 x 60" 36 x 72" 36 x 96"